On a tight budget? Introduce your children to the wonder of growing the family groceries, and preparing simple recipes with the fruit of their labors. Whether planting in the free (and sometimes unusual) containers suggested in Onions in My Boots, or planting in the ground, your investment will be negligible, but the rewards priceless. If your first thought is, "Oh, no; how much is this hobby going to cost?" be reassured that this little book shows beginners how to garden "on the cheap." (Gardening is one of the few hobbies that pays you to have fun.) In fact, depending on what you want to plant, you may not even have to buy seeds! 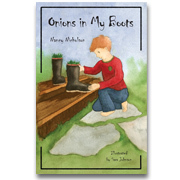 From gardening projects in this book, children will learn goal-setting, decision-making, how to follow through on a project, and patience. Most of all, they will learn of our Creator's amazing plans and providence. Softcover. Illustrated. 97 pgs. 6"x9"